Zynga investor Fred Wilson remained mostly quiet during the Scamville debacle in October. But he’s starting to talk now, and he isn’t happy. In a post about Etsy a few days ago a commenter brought up the Zynga/Scamville stuff. 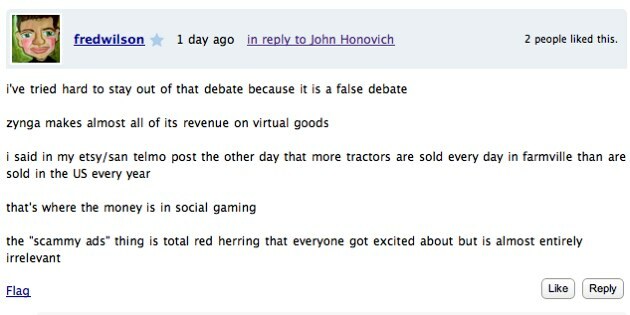 Wilson replied “Citing techcrunch on the zynga stuff is a joke.” He waded into the subject again today on another of his posts, saying in a number of comments “i’ve tried hard to stay out of that debate because it is a false debate…zynga makes almost all of its revenue on virtual goods…the “scammy ads” thing is total red herring that everyone got excited about but is almost entirely irrelevant” and “nobody who got involved in that shitstorm took the time to really do the work and look at what Zynga did and did not do. or compare it to Google and everyone else who does way worse on a daily basis…the whole thing totally annoys me. it’s not fair.” He also said numerous times that we didn’t have our facts straight, and that we didn’t take the time to understand what really happened. Hogwash. Fred Wilson is a brilliant investor, but he’s conflicted and wrong yet again. There were a total of 22 Scamville posts (see updates) on TechCrunch alone. For the most part we left Zynga alone, until we were slammed in the face with CEO Mark Pincus on video saying “I Did Every Horrible Thing In The Book Just To Get Revenues” (how do you take that statement out of context?). Pincus also said “we need to be more aggressive and have revised our service level agreements with these providers requiring them to filter and police offers” in a post about Scamville. And Facebook took one of their games offline for a few days for a violation of their terms of service around scammy offers. Zynga had claimed in the past that fully 1/3 of their revenue came from offers. Some of that wasn’t legitimate, likely tens of millions of dollars, and other companies have said that the bad stuff tended to push out the good stuff. There is an excellent argument that you can continue to find most of these scams on Google and other search engines. But a big difference is the incentive that social games give users to enter into these scams via virtual currency, as well as the fact that they targeted teens without credit cards by pushing mobile subscription offers. Google is wrong to post these ads. But that doesn’t make what Zynga has done right. I think Pincus took the right steps to move his company in the right direction, and I think the industry is on the right track now, and Zynga looks to be a legitimate business even without scammy offers. I support Pincus as an entrepreneur. But to deny that there was ever a problem is irresponsible. And to suggest that we didn’t take the time to understand the facts is outrageous. In addition to the 22 posts where we spoke to dozens of sources on and off the record, I asked Pincus to go on video with me to tell his side of the story without editing. He declined. Zynga continues to be a very close partner to Facebook . They share a major investor, DST. A facebook board member, Marc Andreessen, is also an investor in Zynga. And Zynga is Facebook’s largest advertiser. The fates of these two companies are deeply aligned, and there has been more than a little evidence of wrongdoing. The relationship between Zynga and Facebook needs more scrutiny, not less.